As we talk about Search Engine Optimization (SEO), it helps us to increase more visitors on our website. It would give more traffic and more organic presence. Since most of the people does not know S.E.O, they tend to do small mistakes. 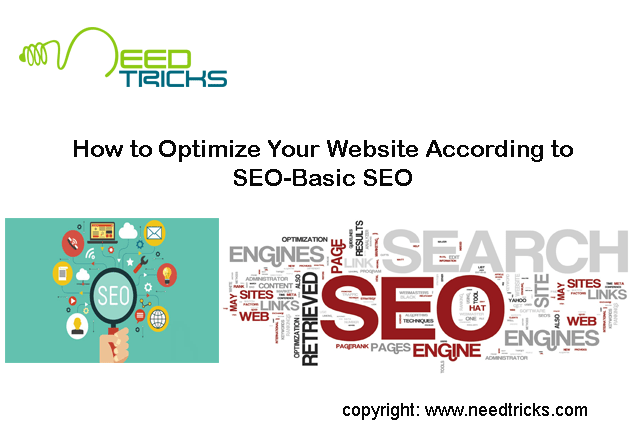 In this Blog Would teach You How to Optimize Your Website According to SEO-Basic SEO. Strictly follow all the basic concepts, which I have mentioned here and I am sure you can get good raking in search engines like Google, Yahoo and Bing etc. Title is one of most the most important part of SEO, so you should know about title optimization in SEO. Keep page title under 70 character with spaces. Title should be sensible and should portray clear meaning. Title should not be very short and most competitive. Make SEO title of post in H1 tag. Meta description is also important part of SEO and it helps to understand summary of your content in few words. It helps both search engine and user about that content which you write thats why search engines give it importance. We can say it can help to import search engine raking. Follow these tips to optimize your website Meta description for every single page. I am sure it would help you a lot. Keep meta description under 160 character with spaces. Use keywords of your title in meta description. Dont repeat same world in meta. Meta description has only few space so try to write best words in few lines. Dont do keyword stuffing in meta. Dont write very short description, write at least 120 character with spaces. There is a very famous saying in SEO Content is King. This is absolutely right if you will write helpful content, there is a chance to earn link from people. Quality content play an important role in SEO. People can link and share your content. How can you write a SEO friendly content? Its a challenging question for you but I have a solution. Write content only for those topics which you have more knowledge. I mean you should understand what you are writing about and have a basic understanding of the subject. Write only fresh content dont copy content from other website because search engines have ability to find copied content. In the Title of your Article/ Blog put Relevant Keywords which are mentioned in your Article / Blog. Use Title Keywords in Your Blog / Article. You also can use LSI (Latin Semantic Indexing) Keywords. If you want to get top ranking in search engine, try to write long content because search engines always give importance long content then short. Use proper internal link in your content, you can link your previous post because it help in SEO link juice. Give link to other high site like wiki if they are relevant according to your content and they provide much information. Try to write content above 500 words. Neil Patel writes at least 3000-4000 words in his article. Use proper keyword density for Focus keywords. You can use keywords density under 2%-3% because search engine use it to understand relevancy of your content. Use relevant images for each article because it helps to attract people, make sure they are not copyrighted from others. In case they are always give credit to the original owner. Search Engines are special types of bots and they are set in specific parameters. Thats why they cannot identify unoptimized images. You should optimize every image. You can also get referral traffic from your images. Name your images descriptively and in plain English. Optimize your alt tags intelligently. Strategize your image dimensions and product angles. Know which image file type to use for the right situation. Basically SEO is just set of rules for search engines. If you follow those rules and write good content, you could get more visitors on your site. And to top it up, you can earn more revenue as well. There are thousands of rules for website optimization for different activity like on-page SEO, off page SEO, link building and SMO etc. but these are basic points which are most important in any SEO field. It is important to know optimize website according to SEO.